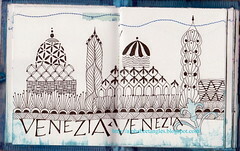 While in Venice, we happened upon a wonderful one-of-a-kind artist who had delightful images of the Venice skyline. I believe his name is - Dero Riflessi (di Venezia). I was able to find his website so you can see his work here. Love his free style. It made me play with patterns that could create the feeling of buildings of Italy. Perhaps with more time this might turn into something . . . 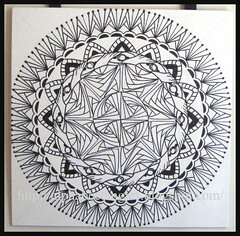 Simple patterns placed in a Mandala on canvas (12" x 12") using a black Sharpie pen. Left unfinished to show students the options of black & white or adding color.